Studio with charm in the heart of the historical center. Renovated with taste, you will enjoy the conception and the design of the studio apartment. Very bright, it is located at the 2nd floor of an old house from the 14th century: foundation stones and high clearance. Full furnished and fitted, fancy decorations. - Bedding: 1 big bed for 2 pers (1,40m=4ft 7.18in) in the mezzanine + 1 convertible sleeper (1,40m=4ft 7.18in) in the living room. - Bathroom with bath and WC. Sheets and household linden included. Well located to discover the historical city Palais Papes, Pont d'Avignon...), close to theaters and restaurants. We spent a week here and loved it. The location was perfect—right in the middle of everything. The owners are very responsive and friendly. We would definitely stay here again. A beautifully prepared apartment in the centre of old Avignon. Great for a couple looking for a little hideaway. Our hosts were great with a bottle of wine in the fridge on arrival. Minutes from restaurants and major attractions. An easy walk from the train station. Would highly recommend. Cool lounge and kitchen with a loft bedroom. Beautiful historic apartment with exposed wooden beams. 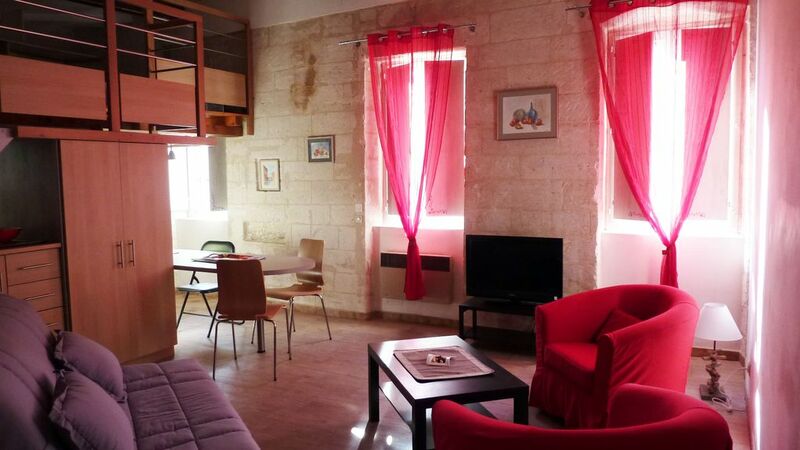 Lovely studio in the heart of Avignon! This is a great studio in the historical old town of Avignon. Really well equipped, has everything you need, close to the main streets with plenty of shops, cafes and supermarkets and just round the corner from Avignon's daily street market. Train/bus stations less than a fifteen minute walk. Highly reccommend. My fiance and I stayed here for a few nights during the summer. The only reason I give it 4 instead of 5 stars is that I wish it had air conditioning. This was a beautiful old building - Ghislaine said 14th century, and from the appearance of the staircase leading to the apartment, I believer her! The apartment was clean, well-decorated, and the bed was comfortable. Do remember to ask about turning on the hot water in case it gets lost in translation. Due to some technical communication issues, our reservation was not confirmed through the website, so we surprised Ghislaine when we arrived. Thankfully no one else had booked the room and she was able to meet us at the apartment despite the fact that our reservation technically was not fully made. Thank you Ghislaine for accommodating us! Appartement tres bien situé, tres fonctionnel et bien équipé. Idéal pour pour vivre un festival sans souci ! Die Wohnung ist sehr schön und geräumig. Wir waren eine Woche zu dritt in Avignon und hatten ausreichend Platz. Geschmackvoll eingerichtet in einem Altbau mit hohen Decken und Deckenbalken. Hat uns sehr gut gefallen. Die Lage ist sehr zentral, trotzdem nicht zu laut. Lediglich am frühen Morgen macht sich die tägliche Müllabfuhr gut bemerkbar. Das Parken ist vor dem Haus für kurze Zeit möglich, um Gepäck zu verfrachten. Ansonsten muss man auf einen der bezahlten Parkplätze ausweichen. Wir haben pro Tag 6,- EUR bezahlt, bei ca. 10 Min. Fußweg. Die Vermieterin ist ein Schatz. Sehr freundlich und hilfsbereit. Sie spricht auch ausreichend Englisch. Der ganze Ortskern ist problemlos per Fuß zu durchlaufen. Man erreicht in wenigen Minuten Bäckerein, Supermärkte, die typisch französische Markthalle. Überhaupt ist man hier mitten im Geschehen, besser geht es nicht. Die Wohnung liegt im oberen Stockwerk, und die uralte Wendeltreppe verlangt einem eine gewisse Sportlichkeit ab. Mit schweren Koffern ist das nicht ohne, aber was soll´s. Ach ja, auch das WLAN ist perfekt: Sehr schnell und kostenlos. Wir kommen wieder ! Pour les réservations pour 4 personnes: la nuitée est à 80€/nuit TOUTES SAISONS. For 4 people booking, the night is 80€/night ALL SEASONS.